Rwandan Minister of Infrastructure Claver Gatete said on the sidelines of a forum in Kigali, that Rwanda looks forward to increased investment in energy sources in order to achieve universal energy access by 2024. 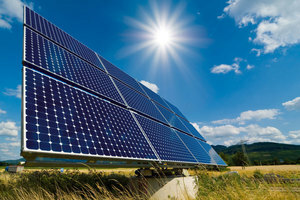 The Rwandan government on recently announced a US $53 million(41 billion Rwandan francs) line of credit which is aimed at stimulating the development and establishment of a solar home system by 2023.The Minister of State for Infrastructure responsible for Energy of Rwanda, Germaine Kamayirese said that the credit line is a part of the World Bank’s Rwanda Solar Electricity Project (NESAP), to be implemented by the Rwandan government via the Development Bank of Rwanda. In an official statement the Rwandan Minister said, “It will also reduce power outage, and improve the electrification rate in Kigali, with an expected positive impact not only on the economy but also on education, health and well-being of the population,”. Rwanda aims that by 2024 all Rwandans will have access to electricity up from the current 46.5% of energy coverage rate, which among the general population is estimated to be at 12 million. Rwanda's energy sector great investment potential, and it is worth noting that the country is looking at increasing investments in different energy sources to satisfy power demand, especially for the growing manufacturing sector and urbanization. Minister Gatete invited foreign and local investors to invest in the country's lucrative solar energy sector, and said that it holds great promise for an attractive rate of return on all investments. With the economy growing at a rapid annual rate of approximately 8% in recent years, Rwanda is unable to keep up with the demand for power which is growing more than 10% each year. The landlocked but strategically located country has kick started initiatives to increase electricity production both on and off grid to ensure that 100 percent households will have electricity by 2024 from the current 22 percent. Kigali alone accounts for approximately 64% of the total power consumed in Rwanda as a whole, but investments in the power transmission and distribution facilities are inadequate for the level of power consumption. Most of electricity production in Rwanda comes from renewable sources of which approximately 60% comes from hydrological resources, along with other indigenous sources and less than 40% comes from diesel-powered generators. Rwanda has envisaged increasing electric power supply by maximizing use of various indigenous renewable energy resources, and to reach its ambitious target of 563 MW (domestic generation + imports) with electricity access of 70%(on-grid and off-grid) by the end of 2018.